Located just south of Lincoln Center, this 1986 51-story through-block building includes 498 rental apartments, 100,000 sq. ft. of medical offices for St. Luke’s/Roosevelt Hospital with a separate lobby on 59th Street and a 125 car garage. 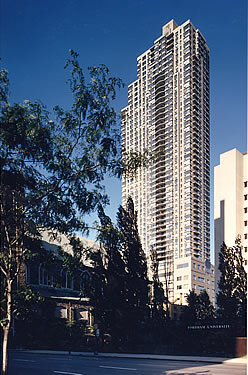 A series of south-facing terraced setbacks beginning at the 43rd floor leave the top of the tower sensitively aligned with the axis of the nearby St. Paul the Apostle Roman Catholic Church.